Summer Camp is offered to children in Preschool 3 through 5th grade (grade level completed this school year). Camp Hours - 8:00 a.m. to 3:30 p.m. with extended hours offered before and after camp (an extra cost). Deposit - $225 is required at the time of registration and will go toward your first week of camp. Registration is from March 1 to March 29. The summer program is open to students enrolled at Memorial Lutheran School, and also to those children in the community. Space may be limited, so early applications are encouraged. If you have any questions about the summer program, you may email Mrs. Rammage. Week 1 – Trails of Texas (Tues-Friday, Memorial Day week) - Dive into the history of our great state - Alamo, famous Texans, the State Capitol and more. Week 2 – Fairy Tales - Learn about and discuss our favorite fairy tales - Alice in Wonderland, Cinderella, Hansel and Gretel, Jack and the Beanstalk, and more. There will be dress-up days, activities, and opportunities to use our imagination. Week 3 – Artful Antics - Learn about art history, artistic techniques, and different art mediums. Campers will create works of art! Week 4 – Futuristic Fun - Explore the world of science and the exciting field of astronomy. Explore and discuss how the world might be different in the future. Week 5 – Vacation Bible School - Fun activities all week-long - Bible stories, arts and crafts, snacks, and fun game time. Week 6 – Stars & Stripes (closed July 4 holiday) - God Bless America! Campers will enjoy patriotic activities, and talk about people who protect and serve our country. A talent show will cap off the week. Week 7 – All Ball (Sports) - Baseball, Soccer, Volleyball and more. Fundamentals of a different sport each day will be taught as we learn sportsmanship, team work and leadership. Week 8 – Greek Greatness - Go for the Gold! Campers will learn about ancient Romans and Greek Mythology. Students will participate in Olympic games and have dress-up days relating to mythology. Week 9 – Christmas in July - Deck the Halls during the heat of the summer! Campers will learn about Jesus' birth as well as the fun of Santa and his elves. Children will make some fun Christmas crafts and enjoy holiday treats. 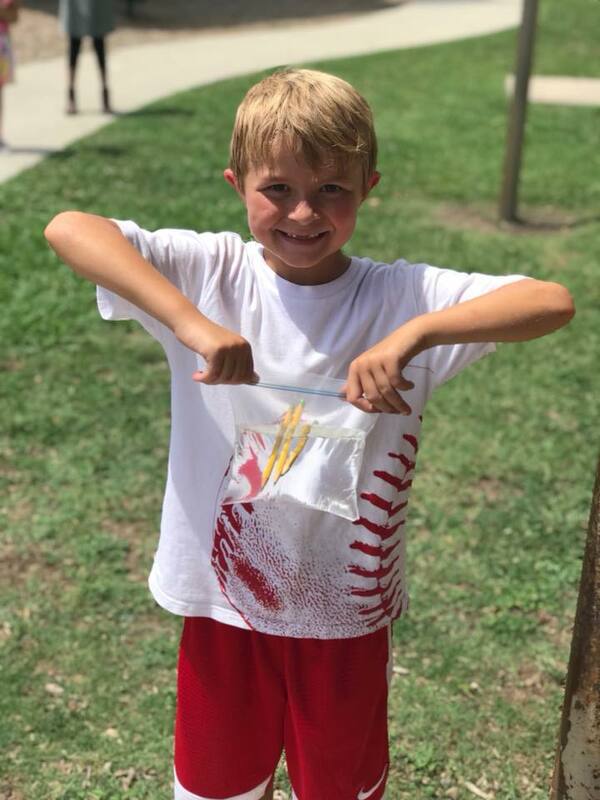 Week 10 – Symphony of the Five Senses - We will have crafts, games, activities, and short lessons that teach campers about our senses of sight, hearing, taste, touch and smell. We will focus on how we trust our sensed to help us with daily activities. Week 11 – Fiesta Week - Our last week of summer camp will be a big celebration! Each day will be a new event or party to help us finish off summer with tons of fun.